There are some NFL games that last in the memory longer than others, especially when it comes to playoff games. 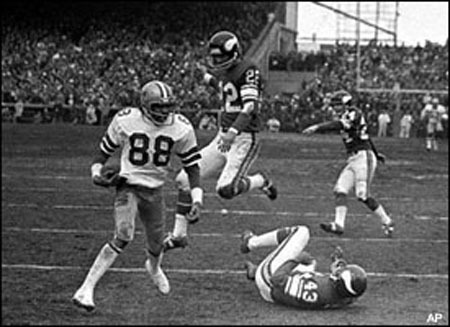 None holds true more than the miracle finish that won the 1975 NFC Playoff game for the Dallas Cowboys over the Minnesota Vikings 17-14. Minnesota was trying to equal the feat of the Dolphins in terms of reaching their 3rd straight Super Bowl. Yet they had to get by the rebuilding Cinderella Cowboys who were in the midst of a rebuilding year. The window was closing for this great team to win that elusive Super Bowl. After the upset loss to the Kansas City Chiefs in Super Bowl IV, the Purple People Eater defense had stayed among the league’s best while the offense had to be revamped. 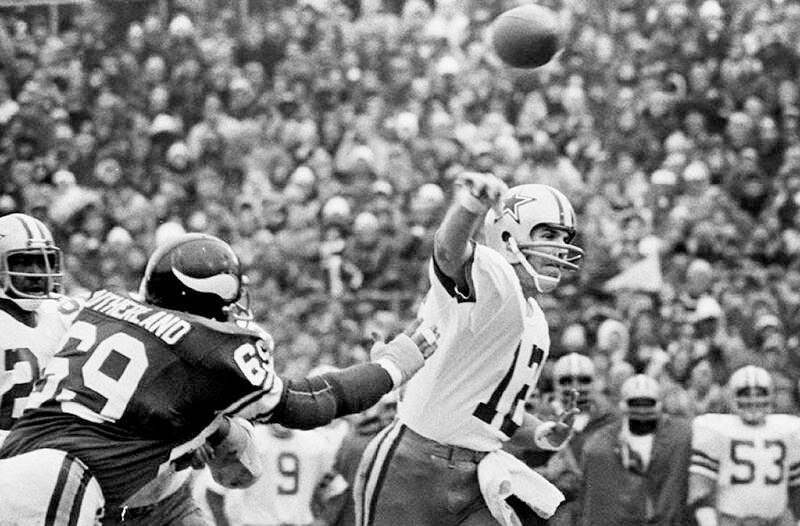 After going a few seasons without having adequately replaced Joe Kapp, the Vikings reacquired Fran Tarkenton in 1972 to add leadership and a grade A quarterback to the offense. Also in 1972, they acquired John Gilliam who became the first deep threat ever for the Vikings. In that first year, Gilliam teamed with Tarkenton to become the first Viking in team history to top 1000 yards in receiving. They finally had some offense but needed one more element and got that boost in the 1973 draft. Chuck Foreman gave the Vikings their first great running back. Combining his skills with Gilliam and Tarkenton and the Vikings made it to the top of the NFC. However back to back Super Bowl losses to Miami and Pittsburgh dulled some of the luster to the 1973 and ’74 seasons. Yet they were seasoned and primed to win it all in 1975. Just have to get past a youthful Dallas Cowboys team that made the playoffs as a wildcard. Easy money….right?? After missing the playoffs in 1974 while transitioning in 14 new players, the Cowboys had said goodbye to familiar faces like Bob Lilly, George Andrie, Chuck Howley, Calvin Hill, and Walt Garrison. Players that had epitomized the era of the “Next Year’s Champion” Cowboys through their ultimate triumph in Super Bowl VI. From 1966-1972 this team was among the league’s elite playing for multiple championships. Yet as we make it into the mid 70s, those aging great players started to retire and a new breed of Cowboys started to infuse the roster. An Ed “Too Tall” Jones in place of a George Andrie, a D.D. Lewis to replace a Chuck Howley. Understand this team had plenty of veterans to lead this young team into this playoff game. MLB Lee Roy Jordan, OLB Dave Edwards, DT Jethro Pugh, and CB Mel Renfro were among the mainstays on defense. On offense Roger Staubach had developed into a complete NFL quarterback. His ability to move within the pocket was enhanced with the installation of the “Shotgun” formation. Coach Landry had re-introduced a formation that was the birth-child of the early 1960s San Francisco 49ers and Coach “Red” Hickey. This hodge podge set of Cowboys made the pilgrimmage to Minnesota’s Metropolitan Stadium for an NFC Playoff Game. The ’75 Cowboys didn’t even win their division, they came in with a 10-4 record and seemed to go as far as their talent could take them…right?? 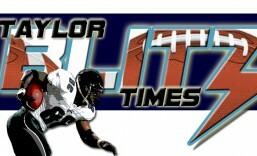 Epilogue: It was this game that launched the mid to late 70’s Dallas Cowboys. Roger Staubach had already performed a great come from behind playoff game against the 49ers in the 30-28 epic1973 NFC Divisional Game out in Candlestick. Yet it was this second one that spread the belief in his team psychologically that they were never out of a ball game with Roger at the controls. This was also the game that ushered in Drew Pearson as a playmaker that would be a scourge for many a Cowboy foe over the next decade or so in the playoffs. They would go on to win the NFC Championship in an upset blowout of the Los Angeles Rams in the LA Coliseum 37-7 before falling to the Pittsburgh Steelers, 21-17, in Super Bowl X. As for the Minnesota Vikings a window was narrowing shut on their championship chances. The great line of Hall of Famer Carl Eller, Hall of Famer Alan Page, Jim Marshall, and Doug Sutherland was aging and wasn’t as dominant as in years past. In the 1976 season, Buddy Ryan was hired to coax one more good year out of this group. They got it even though they wore down toward the end of the season. They made it to their 3rd Super Bowl in 4 years, and 4th Super Bowl in 8 years total yet they lost to the Oakland Raiders 32-14 in the 11th edition. The latter part of the 1970s saw the great play of the Vikings diminish as their stars retired or were phased out. Fran Tarkenton would go on to retire with more passing yards than any quarterback in NFL history with 47,003 yards. The day of the “Hail Mary” game dealt Tarkenton a more severe blow when he learned his father had died of a heart attack while watching the game in Georgia. He was standing in a CBS truck when he learned of his father’s passing. Yet there is one lingering question from the “Hail Mary” game… Did Drew Pearson interfere with CB Nate Wright or did Nate Wright simply overrun the play?? While it can be noted that if you look at the play before the touchdown, you can see Preston Pearson lose his footing. So it doesn’t seem implausible…. Did he push off?? This entry was posted in Historic Writings and tagged 1975 NFL Playoffs, Dallas Cowboys, Drew Pearson, Hail Mary, Minnesota Vikings, NFL, NFL History, Roger Staubach. Bookmark the permalink. I always wondered how Pearson caught that ball. The trajectory always looked to low for him to catch it like he did. A comment on Youtube from a Vikings fan said the ball hit Nate Wright’s leg. And he is correct. It hits his lower leg while he is in the air and shoots between Pearson’s arm and body and sticks right there. No joke, a miracle for sure.